Keeping clothes looking fresh and crisp would be much more simple if we were all flat like paper dolls and every piece of clothing was too. But we're not flat and most of us like a little shape to our clothes and pleats, ruffles, and ruching add some interesting and flattering details. Pleats on clothes can be heat-set or stitched in place. Heat-set pleats hold their shape thanks to the type of fabric selected and a high heat process during manufacturing. Accordion pleats are most often heat-set and are a softer, less crisp pleat. Dry cleaning is best for most fabrics to preserve heat-set pleats. Stitched pleats are usually sharper and have less give because of the stitching. They will hold their shape when laundered on a gentle cycle if the fabric is washable. The crispness of the pleat can easily be ironed back into the garment. Ruffles are made of fabric that has been softly gathered and then stitched into place on a garment along the gathered edge. The folds are usually soft and loose and seldom stitched into place. Ruching, or draping, produces soft folds in a garment that are only secured along the seam edges. The shape is fluid and does not need sharp edges. For a stitched knife-pleated skirt, always use a full-size ironing board. This will allow you to work on only one layer of fabric and a small area at a time. Attach a paper clip, binder clip, or spring-loaded clothespin to each pleat's fold to keep it in place. Using a pressing cloth between the faceplate of the iron and the skirt, place the iron at the top of the pleat and press at the correct temperature for the fabric. Pick up the iron and set it down again farther down the pleat. Never drag the iron across the fabric. Pleats can pucker and shift. Never iron over the clips because it will leave a mark. Carefully work your way around the skirt. 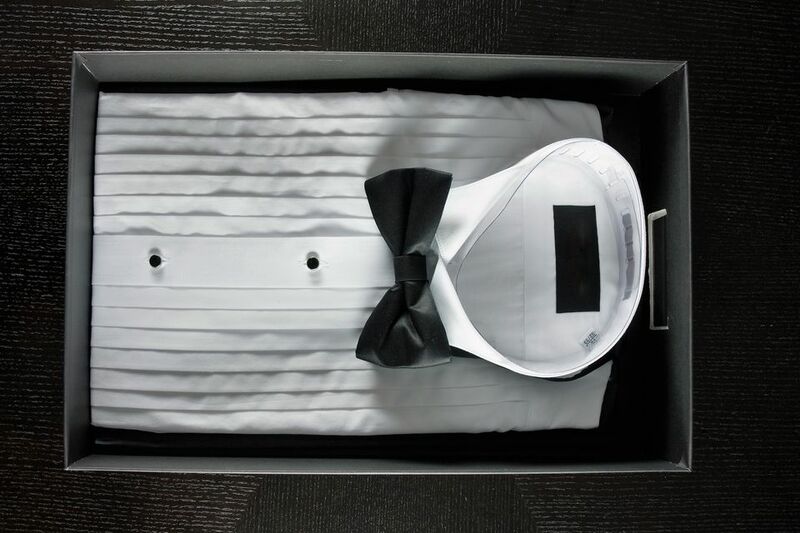 Pleated blouses or shirts, like tuxedo shirts, are easier to iron into a crisp finish if the fabric is slightly damp. Use a spray bottle and lightly mist the shirt all over with plain water. You will also have better results if you use a full-size ironing board so that you can work on separate areas at a time. It is best to turn the shirt inside out and iron on the wrong side to begin. Using the correct iron temperature for the fabric (cotton or cotton/synthetic blend), iron the entire shirt body and sleeves. Then turn the shirt right side out. If you want to add stiffness or body to the fabric, use a spray starch as you iron the right side of the fabric. For less stiffness, use a fabric sizing spray. Start with the collar area flat on the ironing board. Move to the shoulder area or yoke and place it on the narrow end of the ironing board. Iron from one shoulder, across the back of the yoke, to the other shoulder. Move to the sleeves by laying one sleeve flat and extended on the ironing board. Hold the cuff in one hand to make the fabric taut and iron from the armpit across the bottom seam. Then press a crease into the top of the sleeve. Next, iron the cuff and do the other sleeve. Iron the back of the shirt next saving the pleated areas for last. Place one pleated side of the shirt on the ironing board. Smooth all of the pleats with your hand to make sure they are all going in the same direction. Place a pressing cloth over the pleats. Place the iron on top of the pressing cloth. Pick up the iron and place it down again working from the top to the bottom of the shirt. Do not drag the iron because the pleats may shift. Repeat the process on the other pleated side of the shirt. Immediately hang the shirt to allow it to dry completely. Do not wear until fully dry. For ruffles, ruching, and soft folds use a clothes steamer to avoid sharp creases. Hang the garment and carefully move the steamer head over the fabric. If you don't have a steamer, filling a bathroom with steam and hanging the garment on a shower rod will often release any wrinkles. Allow the garment to dry thoroughly before wearing to prevent creating deep-set wrinkles from sitting.